Sendoso is a cloud-based, all-in-one marketing solution focused on the purchasing, management, and delivery fulfillment of company gifting. Sendoso centralizes all outreach elements and gives companies the ability to send company swag, handwritten notes, welcome kits, direct mailers, and custom gifts, like coffee, lunch, tickets, and wine. Sendoso’s account-based marketing helps B2B marketers execute online and offline outreach campaigns, measure gifting and offline attribution, and assist marketing teams to engage and gift at scale. Marketing team members have access to an account-based marketing and sales playbook with gift ideas all from one system. Sendoso automates delivery/fulfillment, simplifies ROI reporting, and suggests new recipients. 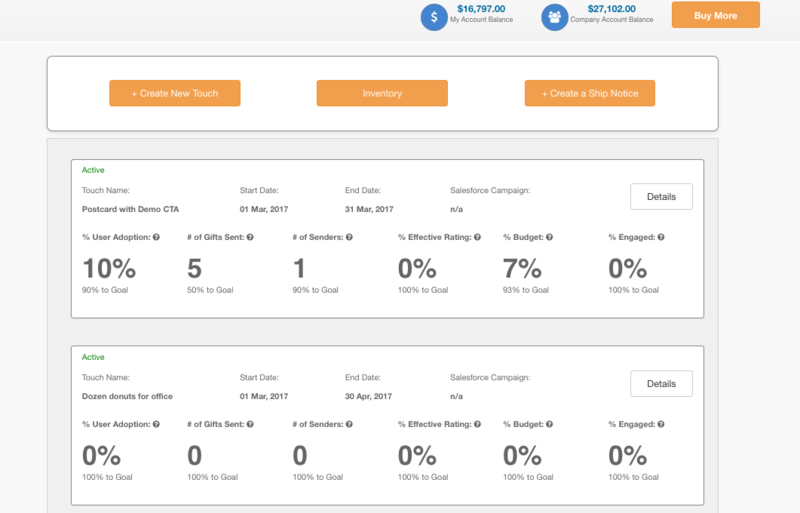 Through Sendoso’s all-in-one platform, users can track and measure all gifting touches across marketing, sales, and customer success. Sendoso generates AI powered suggested gifting based on Salesforce, calendar, and email data. Team members can setup automated triggers and receive weekly reminders to boost engagement with potential customers. Team leaders can centrally manage a team of users, set sending limits, generate real-time team stats, and allocate spending credits. Integrations include Salesforce, Marketo, Engagio, SalesLoft, Eloqua, HubSpot, LinkedIn, Pardot, and many others. Not sure if Sendoso is right for you? Use our Product Selection Tool to compare other marketing solutions. Have questions? Call one of our unbiased Technology Advisors for a free consultation. Learn everything you need to know about Sendoso. Our experts will reach out to you shortly.